We have a fantastic range of blanket boxes to help with any storage issues. Originally used for the storage of extra blankets at winter time, blanket boxes now are used as storage boxes for a wide range of items including bedding, shoes and clothes. 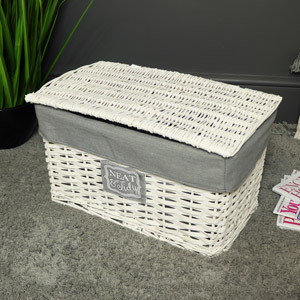 They also make excellent toy boxes, perfect for hiding that clutter in a stylish, elegant fashion. 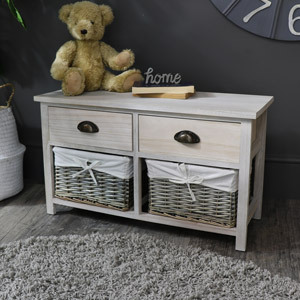 With a wide range of blanket boxes in white, cream and grey designs from shabby chic and French to rustic, country style storage. Our range of blanket boxes don’t have to stay in the bedroom. They can be used for additional storage in the kitchen, hallway or living room. From single blanket boxes to sets of 2, just what you need for all your home storage requirements. With coordinating bedroom and living room furniture, that will allow you to create the room you want. So many styles and colours to choose from that will not only complement your home but give you the living space that you desire. So, if it's a French country cottage you’re looking for with furniture that gives a shabby chic and vintage look or something more elegant and ornate with our mirrored furniture range we will have something for you!